Koolatron Electronic Racket Zapper 3-Pack1.0 ea. Your last line of defense & personal bug zapper. The Bite Shield Electronic Racket Zapper kills all flying insects such as mosquitos, flies, and gnats. Just waving at them with the electric fly swatter to stun and kill them. 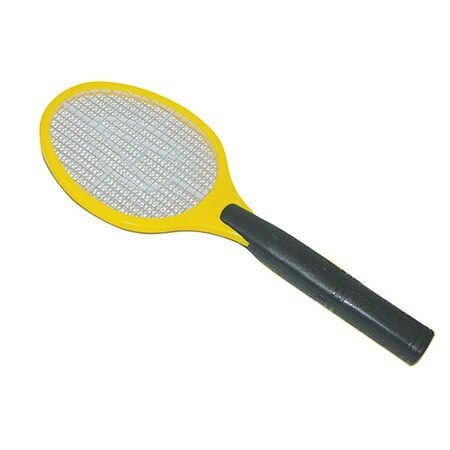 Practice your forehand or backhand at those pesky insects flying around you at the beach, park or in the woods. The Bite Shield Electronic Racket Zapper is small enough to take with you wherever you go. This handheld Electronic Racket Zapper electrocutes all flying insects on contact with the electrified grids. A must for the home and garden. You can take the Electric Bug Zapper anywhere you go such as, to the beach, or on your next camping, hunting or fishing trip. No more swatting furiously at flying insects - just zap them with the Electric Racket Zapper with a simple wave. The Electronic Racket Zapper is battery operated (two “AA” batteries - not included). While it is not a toy and should be handled with care and kept away from children, the output power is relatively low, constituting no real hazard to humans or pets. The electronic grid becomes active only when the on button on the handle is pushed. The Electric Racket Zapper kills flying insects upon contact when activated.